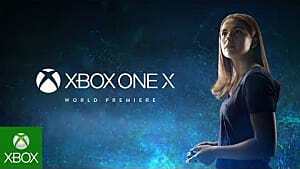 Madden 18 is here. And with another year of gridiron action comes another year where you'll want to be the best coach on the field -- with the best quarterback leading your offense down the field. 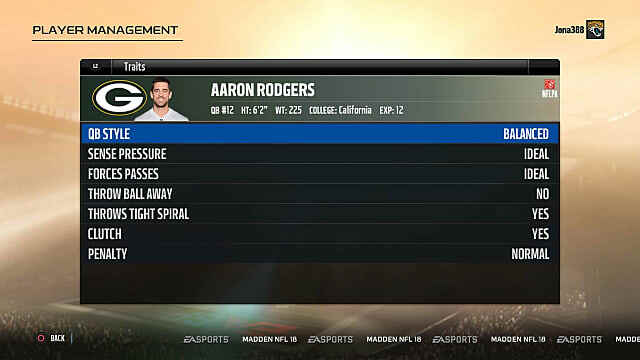 To do that, you need to know who the best quarterbacks are in Madden 18 -- whether they're on your team or on the other side of the ball. 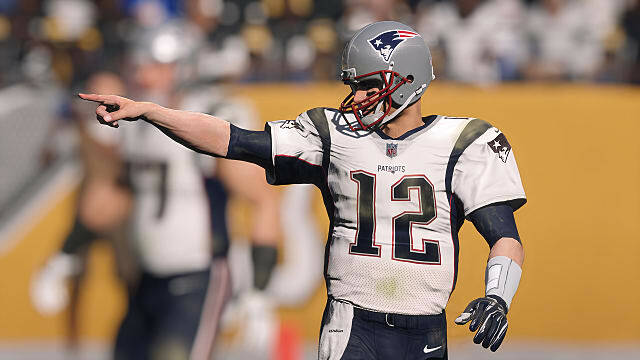 So instead of going through every roster and comparing stat lines yourself, we've put together a guide of the best quarterbacks in Madden 18 and why they'll help you dominate the competition -- or potentially burn your defense. 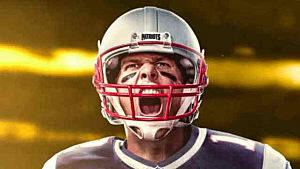 It's little surprise that the New England signal caller is the highest-rated quarterback in Madden 18 -- gracing the cover of both the standard edition and the G.O.A.T. edition of the game pretty much makes that a foregone conclusion. One of the biggest takeaways from Brady's stat line is that because of his 99 awareness score, he's better able to avoid pressure in the pocket and almost always holds on to the ball when taking a hit of any caliber. Only Drew Brees (another pocket passer who also makes this list) can move in and out of the pocket with as much efficiency as Brady. That also means that if you don't move Brady around yourself, he's much less likely to get sacked than other QBs (although it's still possible). Another big takeaway is that Tom Brady's Short and Mid ACC ratings are 99 and 98, respectively. This means that Brady almost never misses throws of 40 yards or less, allowing you to focus on short slants across the middle or 30- to 40-yard post routes with extreme confidence. If we look at Brady's Throw Power and Deep ACC, we see that while Brady can throw the ball deep down field (over 40 yards) with ease, he's not as accurate -- increasing his chances of an interception or incompletion. On top of all that, Brady's traits make him one of the best QBs for new players and veterans alike. 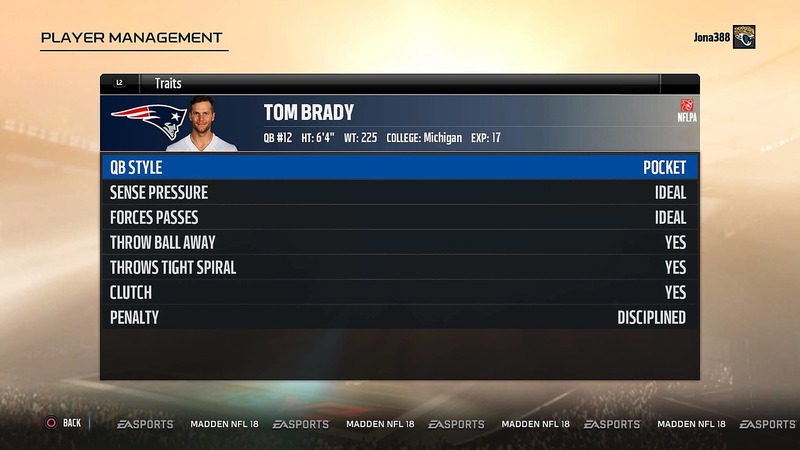 His ideal Sense Pressure trait ensures that he will be calm and collected in the pocket when not under pressure and receive stat boosts faster than other QBs. Under pressure, Brady doesn't panic, either. Instead, he braces for impending contact and gets the ball out fast, while still maintaining accuracy. 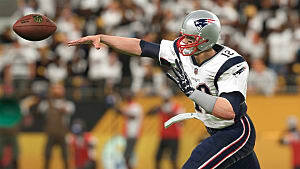 In short, Brady is a lethal pocket passer that thrives when playing the traditional quarterback role. 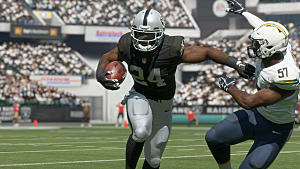 You definitely won't see him running all over the field with those middling Speed and Agility ratings. Instead, you'll want to rely on short- to -mid-range passes to tight ends and slot receivers. Look for passing plays that feature digs, outs, and curls with the occasional fly route to keep the defense honest. 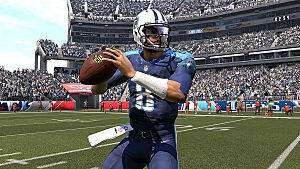 And with a 99 play-action pass rating, you'll also want to keep a few quick-developing PA pass routes in your playbook. Aaron Rodgers has been one of the best quarterbacks in the NFL since taking over the Green Bay Packers from Brett Favre in 2008. And his stat line in Madden 18 reflects his so-far illustrious career -- and uncanny athletic capabilities as a signal caller. Right off the bat, we can tell that Aaron Rodgers has a slightly different skill set than Tom Brady not just because of his Balanced QB trait, but because of his slightly different stat line. In short, Rodgers is a better runner than Brady -- making him ideal for players who like to play a more mobile role in their offensive schemes while still providing accuracy and power in the pocket. He's nowhere near as mobile as Cam Newton or Russell Wilson, but Rodgers is quick and agile when compared to the other QBs on this list. 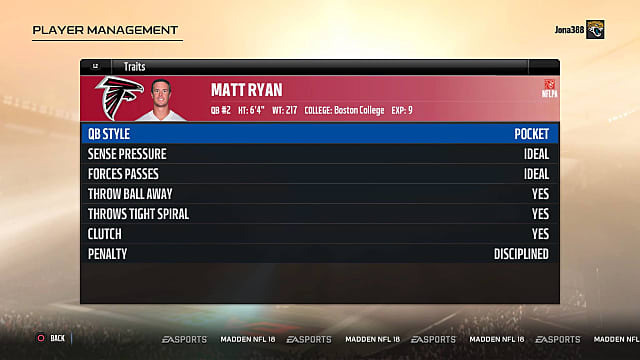 He moves fast on the field with a 79 Speed Rating and makes better athletic moves, such as cuts and jukes, with an 82 Agility Rating. Taking a closer at his stat line, we also see that Rodgers has a slightly better deep game than Brady, but with a sacrifice to his short- and mid-range capabilities. So if you're a player that likes to hit targets down field at 40 yards or more, Rodgers will be more accurate than Brady with a Deep ACC of 89. That means that you can take better advantage of fly routes, deeper outs, and deeper slants while changing things up with short curls and comebacks. It makes sense that the Falcons' signal caller would make this list -- and considering the year Matt Ryan had in 2016, it also makes sense that he'd be one of the best quarterbacks in Madden 18. It's a well-known fact that Matt Ryan is a pure pocket passer and not all that mobile -- even in the open field. Instead, his strengths lie in short, accurate passes, speed, and keen situational awareness. It's clear that Matt Ryan is most efficient when throwing short passes over the middle or in the flat. His Throw Power is decent at range, but strong enough to fit passes into tight windows at 10 to 20 yards. Couple this with his ideal Forces Passes trait (which means QBs are more successful at fitting passes into tighter windows) and Ryan's spirals are often easier to catch -- leading to fewer incompletions on the whole in the short- and mid-range passing game. You'll want to run a lot of curls, slants, and screens with Ryan, with the occasional in-route across the middle at 10 to 20 yards. He can be dangerous with post routes down the sideline -- but like the other QBs on this list, those high-risk, high-reward passing plays can lead to more interceptions (or tips) than completions with a Deep ACC of 88. Make sure to get passes out early if you're looking big plays down the field. Drew Brees may be a short quarterback, but that doesn't keep him from seeing over the ravenous D-line play after play. 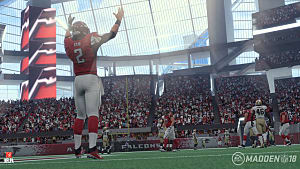 A canny football tactician, Drew Brees leads the New Orleans Saints with confidence and pointed football awareness, making him one of the QBs in Madden. The main thing to keep in mind when it comes to Drew Brees is this: his short passing game. Brees is most accurate and reliable when throwing short passes -- especially with a low Throw Power of 90, which means he can't get as much distance from his spirals as other quarterbacks on this list, and he struggles at fitting balls into tight windows. But with an Awareness skill of 99, Brees is almost impossible to rattle or sack, meaning that you can better focus on reading the defense and watching down-field routes. Looking at Brees' low Speed and Agility ratings, you'll want to keep him in the pocket as much as possible. He's not a great runner and he won't be making defenders miss in the open field. Stick to short passing routes such as curls, comebacks, digs, and outs to carve up the defense. Once defenders start to fill the box, go over the top with some 20- to 40-yard post routes and seems, since his Mid ACC is decent. Anyone who's watched a Pittsburgh Steelers game in the past decade knows that Ben Roethlisberger isn't the most agile quarterback in the NFL. But for a big guy, he can get up and go when the pocket collapses. It's a little interesting that Roethlisberger is rated higher than Russel Wilson and Andrew Luck -- but this is Madden, and sometimes player ratings don't make a whole hell of a lot of sense when you look at seasonal stats. We'll just go with Big Ben's pedigree for his ranking this time around. The biggest takeaway here is that you won't be running with Roethlisberger -- or making defenders miss with jukes or spins. Keep Roethlisberger in the pocket, but keep an eye on defenders coming off the flank or up the middle. 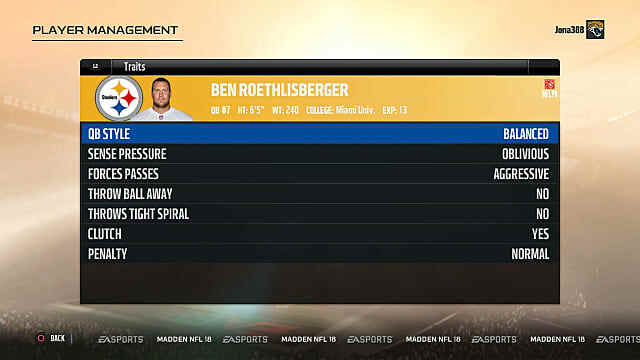 Big Ben's awareness is low when compared to other Top 5 QBs, and when you couple that with his oblivious Sense Pressure trait, you'll find that he's more prone to fumbles and sacks than Brady, Rodgers, Ryan, or Brees. Knowing that, focus on short passing plays and screens with increased pass protection from your O-line. Don't be afraid to hit some of your wide outs over the middle or down the sideline at 40 yards or more, though. With a throw power of 95 and an agressive Force Passes trait, Roethlisberger is able to release bullet passes faster than Brees -- somewhat making up for his low Deep ACC and middling Mid ACC. Alright, this is for all you wildcat/mobile QB lovers out there. Russell Wilson is hands down the best scrambling quarterback in Madden 18. Even though Cam Newton is a beast in 18 and a stellar first-team pick, Wilson just edges him out in Speed and Agility. Russell Wilson is a duel threat on the gridiron because he's a competent passer and dangerous runner. Looking at his stat line, you'll see that like some of the other QBs on this list, Wilson has a relatively strong short-passing game. He's able to hit quick outs, curls, and comebacks under 20 yards with ease, especially with a Throwing Power of 93. However, his biggest strength lies in his Speed and Agility ratings. Wilson is just plain fast, meaning he'll go toe-to-toe with some of Madden 18's best DBs and LBs. But add to that his insane 92 Agility rating, and you'll see that juking those defenders is easier than with almost any other QB. In a nutshell, you'll want to use Wilson as a runner when the pocket collapses or when a big hole opens in the middle of the field. 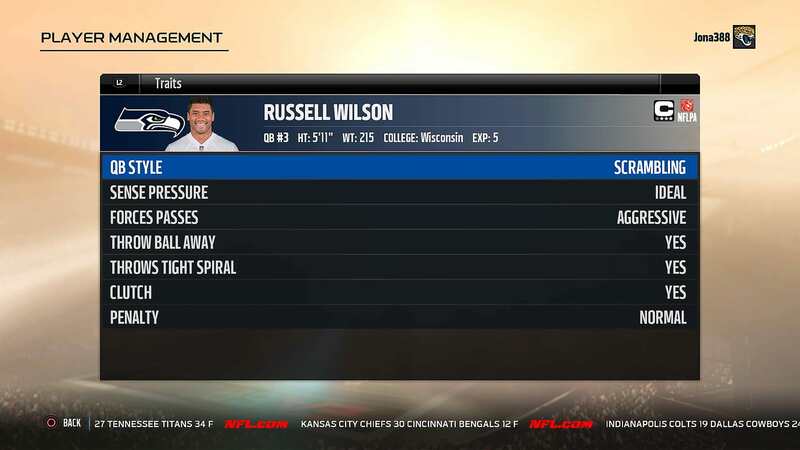 Look for bootleg plays and options to round out your playbook when Wilson is your signal caller. Just make sure to watch for blitzers and inside rushers while in the pocket, as well as big hitters in the open field since his Awareness is low and he's prone to fumbling the ball. 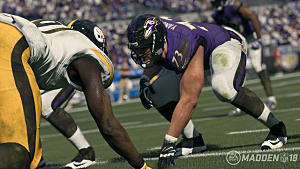 Since the NFL is a pass-heavy league, it makes sense that Madden would follow in those footsteps. In that vein, these are the best pro-style quarterbacks in the game right now. They're almost exclusively pocket passers that thrive on letting their O-line pass block while they scan the field for open targets. However, if you're looking to shake things up just a little bit and you're a more mobile QB player, you'll want to look into Russell Wilson, Cam Newton, and Dak Prescott. Each is stout and carries with him a high Speed and Agility rating, making for perfect for bootlegs, sneaks, and scrambles. At the end of the day, the best signal caller really relies on your playstyle and playbook. But even if you're not playing with any of these teams or players in Madden 18, remember that you can trade for any one of these players -- as long as you've got the cap space. What QBs do you think should have made this list? Who do you think is the best quarterback in Madden 18? Let us know if the comments below! 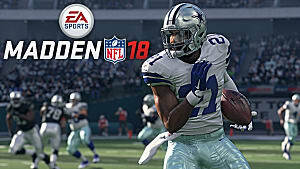 And make sure to check out our other Madden 18 guides for more tips that will help you dominate the field.